Nestled on London’s charming High Holborn, Rosewood London affords a timeless historic respite entwined with modern luxuries and unparalleled English hospitality. Upon arrival, guests are greeted by an ornate archway leading to the enchanting Edwardian courtyard, an elegant sight that only begins to capture the opulence that pervades throughout the lavish London hotel. Set in a 1914 Belle Époque marvel, the Rosewood London encapsulates the idyllic setting for both business and leisure travelers offering 262 classic guestrooms, 44 luxurious suites, and 11 distinguished meeting and event rooms. In addition, an assortment of unforgettable dining selections are available for guests to savor, including classic British cuisine at the refined Holborn Dining Room, Afternoon Tea in the spell-binding interiors of the Mirror Room, and inventive cocktails complemented by live entertainment in the charming Scarfes Bar. Treasured appointments, exceptional accommodations, and gracious service at Rosewood London illustrates an unrivaled essence that elevates the London luxury hotel experience. 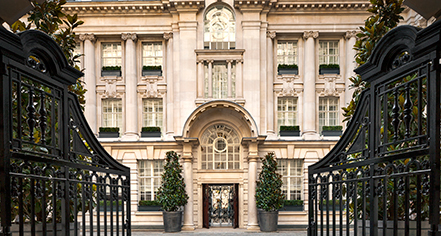 Rosewood London, a member of Historic Hotels Worldwide since 2015, dates back to 1914. The first phase of the prominent historic building’s design was completed in 1941; subsequent stages of development took the next 50 years to complete. Adjoining Rooms: The hotel has adjoining rooms subject to availability. Please notify request at time of booking. Cancellation Policy: Cancellations must be made before 6:00 p.m. the day prior to arrival. Hotel/Resort Fees & Taxes: Room rates include 20% tax. Additional taxes may apply. Parking: Valet parking: Available; rates apply. Pet Policy: Service animals allowed: Yes. Pets allowed: Yes. Amenities: Dog: Bed, Treats, Bowls, Dog-friendly locations. Cat: Bed, Litter box, Toys, Treats, Bowels. Restrictions: Dog and Cat Friendly. Dog Ambassador: Pearl. Transportation: Limo and town car service is available, rates apply. Nestled on London’s charming High Holborn, Rosewood London affords a timeless historic respite entwined with modern luxuries and unparalleled English hospitality. 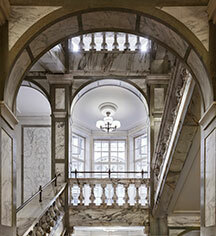 Learn more about the History of Rosewood London .